Certain chronic conditions and medical treatments make people more sensitive to cold weather. As the temperature drops, it’s important to know how to adjust so you can stay warm through the fall and winter months. Hy-Vee Pharmacy Solutions (HPS) offers expert tips on how to survive winter with a chronic condition that makes you sensitive to cold. Dressing in layers is common advice to stay warm outside when the temperature is cold. However, it’s important to wear the right layers. Instead of just piling on clothes, wear fabrics that will keep you warm without causing you to overheat. Outdoor experts suggest starting with a base layer with moisture-wicking fabric, adding a middle layer for insulation and wearing top layer that protects you from moisture and wind. Avoid wearing cotton clothing, especially as a base layer. Although cotton is warm, it absorbs moisture. If you sweat or get wet, it will make you feel cold. Look for clothes made with wool or flannel. Wool is a lightweight, strong fabric that doesn’t really hold moisture. It’s ideal for cold weather. There are different kinds of wool fabric. Wool will absorb some moisture but still keep you warmer than most other fabrics. It’s also naturally odor resistant. Many people associate wool with scratchy, stiff fabric, but there are actually several different types of wool. Common types of wool include merino, from merino sheep, and cashmere made from the fleece of Kashmir goats. Flannel clothing is another good option to keep you warm this winter. This doesn’t mean you have to dress like a lumberjack all winter. The word flannel is often used interchangeably with plaid. Plaid is a pattern, and flannel is a fabric. Flannel is often made from a thick weave of wool or cotton. This makes it warmer and ideal to wear in cold weather. Covering your neck, head and other extremities with scarves, hats and mittens helps you stay warm. However, these items are easy to lose. Keep warm accessories in your coat pockets and hide spares for emergencies in your car, in your purse, in your closet or in other coats. This way you will always have access to cozy accessories when you need them. 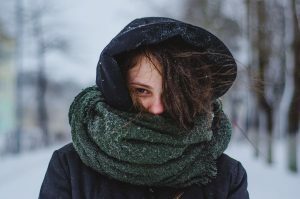 Many people who are sensitive to the cold think about what they will wear outdoors. However, it’s also important to wear cozy clothes that will keep you warm around the house. Your feet often feel cold first, so be sure to wear warm socks and slippers. Be careful wearing socks around the house. To avoid accidental falls, look for socks with grips on the bottom or slippers with rubber soles. You may also want to invest in a warm house robe and thick, fleece-lined pants. Blankets are an easy, portable way to warm up whether you’re inside or outside. If you’re going to a friend’s house for a movie night or bonfire, bring your own blanket. Don’t forget to pack a blanket when you go to the movie theater, football games or other events. Whenever you need both warmth and mobility, Snuggies and other blankets with arms are a good option. It can be helpful to keep one in your car so you always have one nearby. If your chronic illness makes you more sensitive to cold weather, remote starters for your car can make the winter months much easier. Consider investing in the technology that allows you to start your car without leaving the house. This way it will be warm and toasty by the time you’re ready to go. If you don’t have an automatic starter in your car and your seats don’t have warmers, blankets can make you more comfortable. Keep a blanket on your leather seats to keep your rear end warm while you drive. You may also want to get a cloth cover for your steering wheel to keep your hands warmer. There are many hot items on the market to keep you warm in cold weather. If your chronic condition makes you more sensitive to cold weather, hand and food warmers are a convenient way to get extra warmth. These portable warmers have disposable and reusable options. You may also enjoy a microwavable neck wrap made with rice. These warmers are easy to make and are great for warming up around the house or on the go. Space heaters are another good idea to quickly heat up bathrooms, bedrooms and other living spaces. Be careful not to leave your space heater unattended because it can be a fire hazard. A chilly office can make work difficult and uncomfortable for people who are sensitive to cold. People who sit near a window or vent may feel more cold air. Some offices have specific temperature settings and don’t allow space heaters. If you work in a cold office, talk to your human resources department about the best way for you to be comfortable this winter. The Americans with Disabilities Act (ADA) explains how employers are obligated to make reasonable accommodations to give people with medical conditions a comfortable work environment. Hy-Vee Pharmacy Solutions (HPS) takes a whole health approach to managing chronic, complex conditions. It’s our goal to make your life easier, happier and healthier. If you have questions about our comprehensive patient support services, contact HPS or visit the HPS website.